All genres go through cycles and phases. The High School movie is currently deep into a self-referential phase, in thrall to the classics of yesteryear. 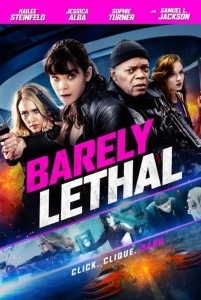 Barely Lethal (2015) is part of this trend, loudly winking at Mean Girls (2004), Clueless (1995), and even quoting a monologue from The Breakfast Club (1985). If only this lineage were more deeply embedded in its DNA, Barely Lethal it might have been more satisfying than the window-dressing that it is. The premise gives it a leg up on some of its competition. Raised in a secret military programme for training spies, Agent 83 (Hailee Steinfeld, MVP of this year’s Pitch Perfect 2) fakes her own death and escapes, determined to live an ordinary teenage life. Despite having thoroughly researched – via the aforementioned teen classics – the newly-named ‘Megan’ finds that (surprise!) high school is even more complicated than she’d imagined. There’s a great joke early on about the reputation that cheerleaders carry in films, and it’s not a fluke. The movie is brimming with terrific one-liners. That sense of humour carries the film a long way; Steinfeld is a natural at comedy, and she is ably supported by a strong cast, including Samuel L. Jackson, Thomas Mann, Jessica Alba, and Disney starlet Dove Cameron. Similarly to Easy A (2010) and The Duff (2015), there’s an uneasy attempt to integrate social media into the narrative. Unlike those two films, it serves actual plot utility – but the plot is Barely Lethal‘s main weakness. There are too many obvious ploys that Megan fails to spot in spite of her obsession with the genre. Her rivalry with fellow teen assassin Agent 84/Heather (Game of Thrones star Sophie Turner) is sidelined for far too long – when the two finally do get to go head to head, things hum along nicely. The great set-up could, and really should, have delivered a better movie than it did, but while it’s unlikely to be remembered alongside the films it delights in name-checking, there’s enjoyment to be had. Steinfeld takes another step towards proving herself a legitimate star, and though she’s yet to have an opportunity to equal her debut turn in the Coens’ True Grit (2010), Barely Lethal is yet more evidence that she is worthy of that status.